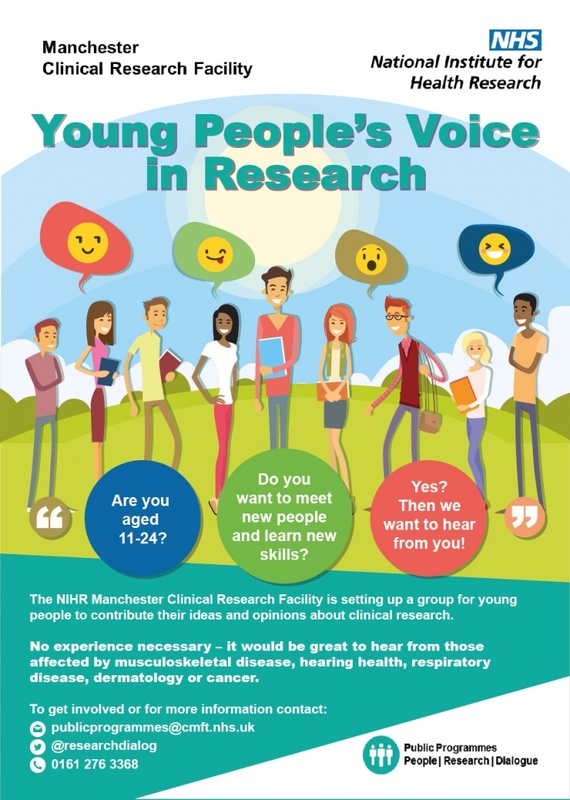 The NIHR Manchester Clinical Research Facility is looking for young people aged 11 – 24 years to help shape the way healthcare research is carried out across Greater Manchester. This will be your chance to contribute and have a major impact on clinical research of the future. No experience necessary! – it would be especially great to hear from people affected by musculoskeletal disease, hearing health, respiratory disease, dermatology or cancer but all are welcome. The first meeting we have an exciting range of activities designed to get you thinking about what is healthcare research and how you can get involved in how it is done. It will take place on Saturday 2nd December 2017 from 1-4pm at Ziferblat in Central Manchester. Alternatively if you have any questions about the group please contact me at steven.edwards@mft.nhs.uk or via Twitter @stevenypag or call 0161 276 3368.